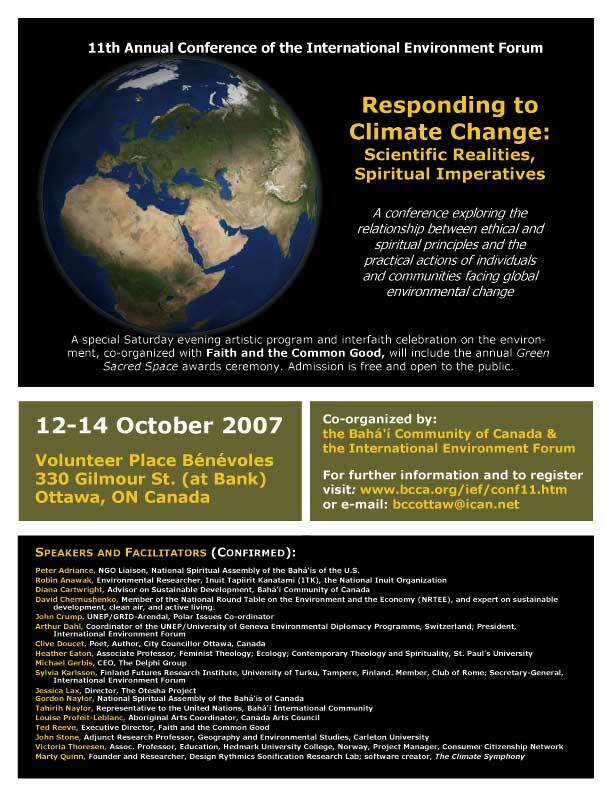 The 11th Annual Conference of the International Environment Forum was co-organized by the Bahá'í Community of Canada, and held in the beautiful hall at Volunteer Place in Ottawa, Canada, starting on Friday afternoon 12 October and ending early Sunday afternoon 14 October 2007. A parallel electronic conference was organized over the Internet for participants from around the world who either could not attend or chose not to travel to Ottawa in order to reduce their environmental impact. A hundred participants from 13 countries of North America, Europe and Africa attended the conference, and another 25 participants from 9 countries followed the electronic conference. All the materials for the electronic conference continue to be available from the programme page and at the conference web site http://tyne.ca/ief2007/. Faced with the need to mitigate and adapt to climate change and its impacts on global society, the conference allowed professionals concerned with the environment and sustainable development, students and the public to explore the human response to global environmental change, including the likely physical, emotional, mental, social and economic stresses on individuals and communities. Specifically, the conference explored moral capacities and better governance mechanisms that help people to build sustainable and resilient communities, and that draw on the experience of pluralist societies like Canada that have welcomed immigrants and 'environmental refugees' from all corners of the globe. Questions of lifestyle, choice and the very nature of 'community' were examined. Reflections on modern science and universal spiritual principles shaped the conference theme, and in recognition of the International Polar Year (2007), specific attention was given to the experience of indigenous and First Nations peoples. The conference was a contribution to the UN Decade of Education for Sustainable Development, and built on previous IEF conferences on related themes. The conference was opened by Susanne Tamas, Bahá'í Community of Canada, who welcomed the participants to Canada, and Arthur Dahl, President, International Environment Forum, who briefly reviewed the purpose of the conference and its theme building on previous IEF conferences. Reflecting on the connection of Inuit people with the earth, he shared the insight that this connection holds keys for meeting the challenges of global warming. Referring to Baha’u’llah’s teaching that the city is the world of the body and the country, the world of the soul, he pointed out that cultures closest to this reality will have significant spiritual insights to offer. The first speaker was Professor John Stone, Adjunct Research Professor of Geography and Environmental Studies at Carleton University (see presentation) (video recording at http://tyne.ca/ief2007/node/27), who woke that day to find that his contributions to the Intergovernmental Panel on Climate Change (IPCC) helped it to win the Nobel Peace Prize. He started by deploring how little real action was being taken to avert climate change, and the issues of morality involved. He reviewed the convincing scientific evidence that present rapid climate change is caused largely by burning fossil fuels, that the earth is out of balance and heading into uncharted territory, and that, while science cannot yet predict where or when the greatest changes will occur, the threat is real and we must act sooner rather than later. He said that the problem is "accentuated in the Arctic" which is warming at twice the global average. Not only is the rate of melting of the Arctic ice unusually fast, but he expects that the rate of change in the climate system will accelerate. The trends in the data sets are clear, and the tipping point where positive feedbacks make change irreversable may be closer than we thought. With reference to the Inuit peoples of the far north, he said: "This is happening in a part of the world whose contribution to global climate change is small, whose bonds to the earth are extremely close and who have learned over the generations how to live under one of the harshest climates in the world, whose coping capacity is strained and community infrastructure and ecosystems becoming more vulnerable." He concluded that an adaptation policy is imperative, and we have a moral responsibility to act. The moral and ethical dimensions of climate change were then developed by John Crump, Polar Issues Coordinator for UNEP/GRID-Arendal (see presentation) (video recording at http://tyne.ca/ief2007/node/15), who described this as a true planetary emergency and a spiritual and moral challenge. The Arctic and Small Island Developing States would be most severely affected. He emphasized the history of adaptation and resilience of the Inuit people. "The Inuit are not victims" he said. "The question is how much adaptation is possible and how much adaptation can the world expect." Speaking to those who warn of a global economic catastrophe and who advocate adapting to, rather than mitigating the forces of climate change, he said that the problem will not be solved by simply relocating communities at risk. On the contrary, "It will take concerted, collective, and coordinated action at the international level" to meet the requirements of the Kyoto Protocol and much more "to work our way out of climate change." "The cost of inaction is much higher, and the most vulnerable regions will pay the most, first. But in the end we will all pay," he warned. We are all global citizens and must recognize our responsibility for our common future. Public attitudes are changing, and a recent survey showed that 75% see climate change as a major issue, but there is a major disconnect between what the public thinks and what governments think. This awareness of an environmental emergency and a spiritual and moral crisis was not shared by governments, some of which are strongly resisting any real action, which he called immoral. He then examined the moral costs of displacing people and the implications for their culture. "There are host of citizen's rights that people have because of the country they live in, and when a nation is relocated, what happens to those rights?" He went on to explain that the threat is the potential extinction of nations and cultures. It is the ethical dimensions he said, that make the adaptation argument "not morally defensible." He referred to the important role of faith-based groups with their global networks, and concluded that no other generation has had this kind of responsibility. Robin Anawak of the Inuit Tapiriit Kanatami (ITK), The National Inuit Organization sent a presentation (also at http://www.tyne.ca/ief2007/node/11) that gave the audience a glimpse of some of these vulnerabilities. He noted the impacts of global warming on food security, housing, environmental contaminants, coastal erosion, security in the Northwest Passage, sea level rise, wildlife and diet issues, culture, language, and traditional knowledge, the rise of invasive species, challenges of community infrastructure, hunter safety, new diseases and many more. In the discussion concluding this first session, further examples were given of the challenges facing the Inuit, including robins, moose and deer moving north where they never occurred before. The people needed to share their concerns and talk about them, and not be left isolated. Climate change would result in an extraordinary increase in refugees which must be managed. In response to a question about methane, a potent greenhouse gas, Prof. Stone said that methane levels seem to have stabilized for unknown reasons, but melting permafrost would release large quantities of methane from northern peat lands. The effort to stabilize greenhouse gas concentrations by mid-century would only require a small fraction of annual GDP. What was missing was political will and imagination. Arthur Dahl, Coordinator of the UNEP/University of Geneva Environmental Diplomacy Programme in Switzerland, and President of the International Environment Forum (see full paper and presentation) (video recording at http://www.tyne.ca/ief2007/node/16), emphasized the size of the threat from climate change and our individual responsibility for causing it. With the rapid changes now observed in polar regions, a significant response is urgent. The human impacts will include increasing natural disasters, food and water shortages and population displacements, with the greatest impact on the poor. The economic impacts threaten the world economy. Speaking of western industrialized nations, he said "we have built a civilization away from nature. We have trapped ourselves in an unnatural system." The problem with this system is that it is based on fossil fuels causing global warming, he said. "There is a kind of inertia and momentum to continue on this path. Look at how vulnerable our civilization has become to the changes to come in one or two decades." He mentioned some of the challenging ethical questions we face. Could we ever decide to stop burning fossil fuels before they run out? Can we maintain the growing world population without the energy subsidy from cheap fossil fuels? He pointed to the root cause as the materialistic values of the present economic system supporting a self-centred consumer society and the breakdown of traditional morality. New ethical foundations were needed in society to respond to climate change. As the baha'i International Community has pointed out, the economic system needs to equip people and institutions to develop human consciousness. Its goal should be a just social order that is altruistic and cooperative, creating employment and exterminating poverty. Civilization should combine and balance the material and spiritual, and see the achievement of sustainability as a fundamental ethical responsibility. This will require moderation and a respect for the ecological balance of the planet. Such an ethical approach is essential to be able to respond to climate change in an adequate way. Heather Eaton, Associate Professor of Feminist Theology, Ecology, Contemporary Theology and Spirituality at St. Paul's University, Canada, examined the ethical dimensions of the issue from another perspective (see her complete speaking notes) (video recording at http://www.tyne.ca/ief2007/node/18). She started by identifying climate change as a complex political and cultural phenomenon. "We live in a sea of cultural ideologies," she said, "that nurture notions of social wellbeing in terms of progress, economic growth, unlimited materialism, industrialization and technology contributing to climate disruptions." It is also an ethical and religious issue on which she offered three reflections. Dr. Eaton pointed out that religions have much to offer to the ethical "frameworks of climate change" in terms of transformation of the self, social ethics and ecological ethics. "Religion teaches us about our will and thoughts. It teaches us about solidarity with others, and the Baha'i tradition has much wisdom on this." Examining some of the religious traditions of the world, she went on to show what religions can contribute. "Religious teachings are concerned about interior human dynamics." They teach us how "to educate our desires." Religion, she explained, connects humanity to the sacred; "It is urgent for religions to reclaim that the beauty and elegance of the natural world have been inspirational and revelatory of the Divine since time immemorial." She said that reconnecting with the sacred then becomes the foundation for the work before us, adding that: "human beings never destroy that which they consider to be sacred." Secondly, she said that religions are in transition, and warned that for religions to play a role in addressing climate change "religious communities need to become scientifically literate." They must read the signs of the times, re-examine their world views and assumptions about reality, and see our inter-relatedness, our dependence, and that matter and spirit are intimately interwoven. Her third point was the need for a spiritual awakening to the Earth or spiritual consciousness of the Earth as sacred, full of creativity, diversity, power and beauty. She concluded "If we can cultivate awareness of this magnificent Earth, and see ourselves as members of this Earth community, then we will find spiritual resources that we have not yet imagined." The day opened with a devotional programme of spiritual reflections and a brief summary of the Friday session. Michael Gerbis, CEO of the Delphi Group, an Ottawa environmental consulting company, is one of 20 Canadians who have been trained by Al Gore in giving this presentation on the causes, effects and solutions to global climate change. Mr. Gerbis said the correlation between the accumulation of so-called "greenhouse gases" and increasing global temperatures is now clear, and the effects are visible everywhere. He presented stunning visuals showing the retreat of the glaciers world-wide. The Inuit, of course, see this at first hand in their hunting and living grounds. One polar scientist said two years ago that the northern polar ice could be gone by 2100; now he estimates 2030. We are seeing the accelerating effects of positive feedback loops in which each individual aspect contributes to the acceleration of all other factors. This is most dramatically seen, perhaps, in the rapid melting of the Greenland and Antarctic ice shelves, and is beginning to be seen in low-lying territories. And why shouldn't these effects be exponential? Look at human population's soaring growth. But perhaps the biggest problem is our way of thinking: our denial, our unwillingness to sacrifice privilege and comfort and the apparently urgent imperatives of economic growth. It is a sobering picture, but there is much that is positive in the presentation. There are many examples of the scientific and technical prowess to make dramatic changes, but the ethical impetus is still lacking, as is the leadership by corporations and especially by governments. Gerbis is a businessman, who finds the countervailing economic arguments – we can’t afford to take these environmental measures, we’ll go out of business – very short-sighted and limiting. There are major economic opportunities out there, which his own company is based upon. There are lots of off-the-shelf technologies and personal changes of habit, from low-flow shower-heads to better insulation to municipal transit to organic foods or green power or fluorescent light bulbs. A little research reveals many possibilities. But the main place of change is in people’s hearts. It is our moral obligation to do everything we can to give the planet back to our children in such a way that it will benefit them. The earth will be fine, it’s not going anywhere, but will it be a liveable place for those that follow us? For more complete notes by a volunteer reporter, click here. The presentation was followed by questions and open discussion on the moral implications of the presentation. Three speakers, convened by Diana Cartwright, Advisor on Sustainable Development to the Baha'i Community of Canada, developed the ethical implications from different geographic perspectives. Ted Reeve, Secretary, Leadership and Theological Education, for the General Council of The United Church of Canada, and Executive Director, Faith and the Common Good Network (see presentation; video recording at http://www.tyne.ca/ief2007/node/26), asked: how do we respond to the challenges of climate change? How do we take this to our faith communities? What is our gut reaction to the presentation? We may first be stunned, then go into denial or overload, before asking how to manage it. He described the ethical quadralateral of experience, facts/reason, scripture and tradition, and asked what gives us courage and the hope to commit to action. The "Greening the Sacred Spaces" project of Faith and the Common Good demonstrates that change is possible, both practical and spiritual, in small steps, with the greening of many sacred buildings. We are coming into a time of tribulation. How does our faith tradition help in times of crisis? We must appreciate divine connectedness and sacredness, and understand processes of breakdown and renewal. Next Sylvia Karlsson, a senior researcher at the Finland Futures Research Centre, Turku School of Economics, Finland; Associate Member of the Club of Rome; and Secretary-General of the International Environment Forum (see presentation; video recording at http://www.tyne.ca/ief2007/node/21) described the enormous energy poverty in the world. The unequal energy consumption behind much poverty should motivate us to change. There is an unequal distribution of fossil energy resources, but renewables are available everywhere. Energy policy has an important impact on development. She said energy use is a common affair, but it requires more governance (meaning more than government) at all levels. Internationally, there is no global energy governance, no UN energy agency, and no normative framework for energy policy. The issue is too close to national security. Governments are beginning to discuss it in the context of climate change, but have great difficulty in considering energy directly, as illustrated by the impasse on energy, and the need to shift from fossil fuels to renewables, at the 15th UN Commission on Sustainable Development in May 2007. International energy governance should have three roles: mediating conflicts over energy resources, facilitating the transition to renewable energy resources, and addressing global energy disparities. All of these require application of the principle of justice. National energy governance involves rules and regulations, investment patterns and subsidies. At this level both government and the private sector can facilitate personal choices. The energy sector is presently closed and male-dominated, and also the most corrupt because of the easy access to money in fossil fuels. To reduce climate change, we need strong immediate decisions favouring energy efficiency, savings and renewables. But taking bold (and sometimes costly) decisions on long-term energy planning requires trust, and trustworthiness is presently lacking at this level. Individuals, families and communities can do much at their own level to choose more efficient appliances and renewable energy sources, drive less, fly less and consume less. This means applying the spiritual principle of being content with little. We can learn to live more with less energy; good attributes and virtues do not require energy. Finally Tahirih Naylor, Representative to the United Nations for the Bahá’í International Community in New York (video recording at http://www.tyne.ca/ief2007/node/24) noted that on 11 July 2007 the UN Secretary-General called on governments to unite on climate change, which affects the whole of humankind. He said business as usual is no longer an option. Mrs. Naylor said we need a new type of thinking based on values, since peoples' values shape everything. She referred to Thomas Homer-Dixon's classification of utilitarian values (our likes and dislikes, driving us to fill the void of meaning with consumerism), moral values (fairness, justice), and existential/spiritual values (about the meaning of life). What are the responsibilities of countries to reduce greenhouse gas emissions? How can developing countries meet their needs without emitting greenhouse gases? To what extent is climate change precipitated by the economic system? What is the value of future generations, and how do we consider their interests now? Is access to scientific knowledge a universal right? How do we convert that knowledge to mitigation and adaptation? These issues require discussions with governments, the private sector and faith-based communities. gender equality, since women and children are more vulnerable, are affected differently, and are under-represented in decision-making, but have great potential to respond to climate change. The BIC hopes to generate and contribute to the discussions on climate change. The panel discussion convened by Arthur Dahl on the theme "Value-Based Approaches to Environmental Action" featured two of Ottawa’s citizen leaders and an American guest. The first panelist was Clive Doucet, a poet and author (Urban Meltdown) turned City Councillor in Ottawa, Canada (video recording at http://www.tyne.ca/ief2007/node/17), who is one of Canada’s strongest voices for re-imagining cities. His work for the greening of Ottawa, as an elected official, has allowed him to see both what is possible and the nature of the obstacles to those advancements. The struggles of Canadian cities to reduce sprawl and the dominance of the automotive culture, which are readily seen in the awkward development of surface-rail mass transit systems, were featured in his comments. The importance of connecting with the wider community was emphasized by Peter Adriance, the NGO liaison for the National Spiritual Assembly of the Bahá’ís of the United States (see presentation) (video recording at http://www.tyne.ca/ief2007/node/10). He started with impressive stories of grassroots development in two very different parts of the world. In Nairobi, Kenya, he witnessed the resilience and resourcefulness of deeply impoverished women who nonetheless were able to make substantial changes in their prospects. This illustrated the importance of spiritual connections and the possibilities of hope. In Chesapeake Bay, the fishers of Tangiers Island had been under pressure for a long while from environmentalists, but only when they were moved by the sacredness of the body of water that was their livelihood did the message of sustainability reach their hearts and their fishing practices. He outlined some of the experiences and learning of various elements of the American Bahá’í community, and its collaboration with other faith-based organizations in support of the Decade of Education for Sustainable Development ( http://www.uspartnership.org). Building on the common teaching of all faiths to love one another and to care for the creation, they helped people to connect spirituality and sustainability, and to take actions for a more peaceful future. Lessons learned from this experience included the essential roles of faith communities, the power of religious teachings, the value of collaboration beyond each faith's immediate community, and the potential for community building. finding ways to measure progress with value-based indicators for the spiritual roots of development. The final Saturday session was convened by Duncan Hanks and featured Gordon Naylor, member of the National Spiritual Assembly of the Bahá’ís of Canada, President and CEO of Hatt's Off Specialized Services, and President of the Nancy Campbell Collegiate Institute and Breakwell Learning, who discussed the development of the moral capabilities necessary for sustainable action on climate change (see presentation) (video recording at http://www.tyne.ca/ief2007/node/23). "Let your vision be world-embracing, rather than confined to your own selves." This famous passage from the Bahá’í writings, Mr. Naylor began, is no mere sweet statement of amity. It is a radical call to moral and ethical advancement. "What if we imagine," Naylor asked, "that we know little or nothing of the spiritual principles and how to apply them to a future we can hardly conceive of?" He urged us to imagine precisely this, putting ourselves in a humble, learning mode. He suggested that we think of this (un)imaginable reality as an acorn, which will attract to itself what it requires for growth into the magnificent oak that one knowing only the acorn could never have dreamed of. We don’t know and can’t imagine the civilization that must come, that we need to build, and we shouldn’t waste time and energy trying to make it in our own drastically limited images. One of the many moral capabilities that Mr. Naylor works with in his youth care facilities and in the school that he founded is encouragement. We must find ways to joyfully appreciate the talents and capacities of others. A mature respect for the rights of others is another of these capacities. Individually, we move from utter self-concern into awareness of and, ideally, contributions to the reality of others; as a world society, we need this same movement of respect and encouragement. Religious communities, especially, need to develop this capacity, and specifically to develop the humility to not assume that they have the answers already. be a responsible and loving family member. An orientation of service to the common good. Leadership whose purpose is individual and social transformation. Belief in the essential nobility of the human being. Commitment to a world-embracing vision. He then put the assembled conferees into groups to work with and consult over these constellations of virtues and concepts and capacities. What can you most use, among the list of capabilities, in your work for sustainable development, right living and social transformation? Sunday morning started with the 11th General Assembly of the International Environment Forum, including a review of its activities over the past year, the election of its Governing Board, and consultation on future activities (see separate report). The conference programme began with a beautiful devotional combining spectacular photographs and quotations on spiritual and environmental themes. The speakers in the final conference session addressed the challenge of climate change at the individual level. David Chernushenko, Producer of the Living Lightly Project and Member of the National Round Table on the Environment and the Economy (NRTEE) presented a positive response to climate change including examples from his own life (see presentation) (video recording at http://www.tyne.ca/ief2007/node/14). An environmental consultant, activist, and author, and a former leading voice of the Canadian Green Party, he took the conversation from the abstract and global perspectives often expressed during the conference to the tangible, immediate and home-based things that families and neighbourhoods can do. His personal motto translates the polysyllabic “sustainable development”, whose accompanying acronyms and complex conceptual frameworks can be a barrier to acceptance of the simple goals of balance and awareness. David speaks of “living lightly”, both in terms of reducing our ecological footprints and, equally important, of making these choices and day-by-day advances with a positive spirit and an unfurrowed brow. Fresh air, not cold air; there are lots of ways to cool, so only go to the air conditioning when you really need it. Use natural shade and ivy. Hang your clothes to dry (outside, the side benefit is that you actually get outside, know your community, know the weather without going to the Internet to find out; inside, it’s remarkable how fast clothes dry inside and humidify a dry, winter house…). Recaulk your windows and replace those incandescent bulbs. And when you walk out the door in the morning, ask yourself: What’s my best transportation choice today? There’s no need to bicycle grimly, because it gives us time to think and move and breathe and make humane connections with others. There’s no need to wait until the municipalities build better mass transit; if you use it, they will build more. Make one step. Then make another. It’s simple, and it’s light. (Upon light!) Imagine a better world; you are already heros. Distinguished European educator Victoria Thoresen, Associate Professor of Education at Hedmark University College, Norway, and Project Manager of the European Consumer Citizenship Network (see presentation) (video recording at http://www.tyne.ca/ief2007/node/29), discussed the challenges of making responsible choices. Even the Neanderthals had to make choices affecting the environment as well as about bigger issues like poverty, wars and molesting each other. Teachers and parents might face 2500 choices before breakfast, but most of these we make automatically and naturally from our principles and ethics. Ms. Thoresen challenged the attendees strongly to think about the third world and its relationship to lifestyle choices. She spoke of the things that perhaps had not been covered sufficiently. Many of her frankly imploring messages – I beg of you, please consider… -- urged the perspective of parents and teachers and the needs of their children and youth. She asked everyone to articulate their vision, increase their awareness, reflect critically on the situation, and develop a global civil spirit of servitude and a culture of learning. This required digging through commercial pressures and developing personal indicators of a responsible lifestyle, with greater commitment and involvement, helping others to find the things they need to do. She referred to many values that were needed: trust, respect, cooperation, moderation, etc. Sufficiency: This vocabulary is important; how much is enough? How do we assist young people to withstand the barrage of materialist messages, hidden and blaring, that rain down on them? Courage: In ways small and large – there are powerful, vested commercial interests that are grimly opposed to the message of sustainable consumption – we mustn’t forget that courage doesn’t come easily! Encouragement is gold. Diversity of response: While we tend to speak in terms of what we all should do, there can be a judgemental tone to this kind of discourse. We must respect individual choices and efforts. Not everybody should be doing the same thing, even if was possible! Dr. Thoresen also implored us to remain mindful of the UN Decade of Education for Sustainable Development, 2005-2014. There are tremendous resources developed for this decade, which should be prominent in school curricula. Also, the United Nations’ Millennium Goals have faded into the background in many consultations (including this one), and she reminded us of their importance. She was able to speak only briefly of the Consumer Citizenship Network and its work to create debate and enlightenment about “the pressing need for consumers to understand the ethical choices that they make”. She also mentioned “LOLA”, a project in “Looking for Likely Alternatives” that the CCN has developed. It is a way of reaching students and teachers that helps them to understand sustainable development and their own contributions to it. The last event of the conference was a workshop to help each participant create their own action plan for personal activities to respond to climate change, facilitatated by Diana Cartwright and Peter Adriance (see presentation). They took the conference through a process in which we contacted moments in our lives when we felt that we had taken useful action about climate change. After each workshop group around a table got to know the kinds of efforts and attitudes that had animated their associates, individuals were then guided to examine their own contributions, to develop new goals, and to plan what actions they and their communities will take. And how about you, who are now reading this conference report? What are you able to do? How can you multiply your efforts as you plant seeds and collaborate with others? Peter Adriance wrapped up the workshops, and then Arthur Dahl, President of IEF, provided some closing remarks. He said this is not a conference where you can go home unchanged and unmoved. The scientific realities show there are already signs of rapid climate change, of such significance that they had just earned the Nobel Peace Prize. The crisis of climate change was laid out clearly early in the conference, as were subsequently the ethical and spiritual dimensions of the human response to it. A small disappointment for the organizers was that indigenous (especially Inuit, those who may be suffering the most from climate change) and Francophone representation wasn’t greater. As a species, we’re on a very fast train that is certain to crash, and we can’t simply get off. How do we slow the train down? How do we prepare the passengers and lessen the impact that is surely coming? Much of the challenge for individuals is how to prepare ourselves and take moral leadership in integrating changed lifestyles, habits and perspectives into our lives. We need to prepare our children, our communities, with more awareness and solidarity. We need to prepare the world with better international governance. We need integrity; we cannot live as if we do not know what we have now learned. Another challenge for the IEF community, for all communities that have become mindful of the need for change: how do we widen the appeal of these ideas? How do we awaken the same level of concern and hopeful effort in the broader community, building partnerships across nations, cultures and religions? We need positive visions of the future that are both scientific and spiritual. We need the hope and enthusiasm of the Otesha Project. He gratefully and graciously invited all of us to become ever better links in the chain of human growth and betterment. Participants left the conference with a better understanding of the social, environmental and economic implications of climate change, the spiritual principles and ethical considerations that should shape and guide strategies to mitigate and adapt to climate change; and the role of faith communities in responding to the challenges presented by climate change. They understood the relationship of their personal behaviour to this global challenge, and were prepared to modify their life-styles and actions, and to educate others to respond more effectively to climate change. An environmental children's program (ages 5-13) was provided by CanaDiana UnlimiTed on Saturday and Sunday that included the 'Cosmic Walk' looking at the Wonders of Creation and a visit to the Museum of Nature. A compilation of Baha'i resource materials on environment and sustainable development prepared for this conference is at the resource materials page. Some photographs of the conference are on the photographs page. More are available in the Gallery on the IEF 2007 conference web site.